It's that time again where we bring together the best of the best with holiday wedding roundups from around the web! Fourth of July is a very popular wedding weekend here in coastal Virginia, so enjoy these July-friendly wedding ideas! From real weddings to inspiration boards to fun DIYs, we've rounded up some great inspiration for you to love 'Murica even more! 1. If you missed our patriotic military-inspired wedding a few weeks ago, it's a must see! Who doesn't love a man in uniform and a gorgeous bride? 2. 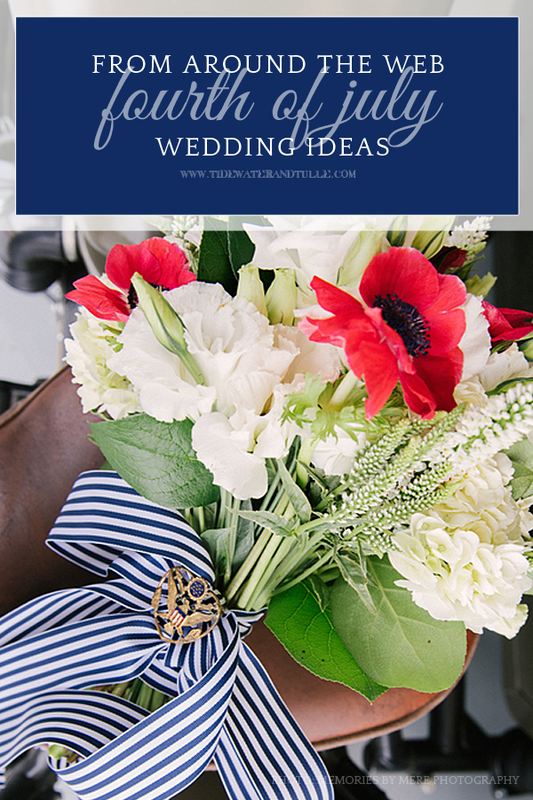 This preppy classically red, white, and blue wedding inspiration on Elizabeth Anne Designs is perfect for a July celebration! 3. Americana never looked so good with hot dogs, peanuts, and apple pies in this sweet wedding inspiration on Artfully Wed.
4. If you're not into the bolder hues of patriotism, then these subdued berry and navy wedding color ideas that Chic Vintage Brides put together in inspiration boards are simply swoon worthy. 5. Because pink technically IS a shade of red! Any girly-girl will love this chic real Fourth of July wedding on My Hotel Wedding that pays homages to the flag's colors with a dash of pink goodness... including a blush wedding gown! 6. You can't get much more American than red gingham. Kiss My Tulle put together sweet picnic inspiration à la red, white, and blue. 7. Simple, sweet, and country is the theme behind this patriotic wedding shoot on Swooned. The food alone makes me drool! 8. Lovers of all things vintage, Americana, and DIY will adore this real Independence Day-inspired wedding on Brenda's Wedding Blog. Coca Cola bottles, seersucker, and shabby chic details abound! 9. For all you Hampton Roads locals, we gave a nod to Mount Trashy last year with our fireworks-inspired wedding inspiration board. It's mega-sparkly! 10. Considering whether or not you even want to have a Fourth of July wedding? These tips on Mountainside Bride are perfect to help you decide! And double bonus, some great DIYs to do for your summer holiday wedding! Photo by Memories by Mere Photography. To see the patriotic inspired wedding, head over to the full feature here on Tidewater and Tulle.